Akebia quinata (Houtt.) Decne. in Ann. Sc. Nat. Ser. II. 12:107. 1839. Curtis, Bot. Mag. t. 4864. 1855; Bailey, l.c 24; Rehder, l.c 221. A tall climber, climbing up to 6 m. or more, branched, glabrous. Leaves digitate, long stalked; leaflets 5, ovate, obovate to obovate-oblong or elliptic, 3-6 cm. long, emarginate at apex, glabrous, glaucous beneath. Racemes axillary monoecious. Flowers fragrant, females slightly larger and with longer pedicels than males. Female flowers purplish-brown, 2.5-3 cm. in diam. with broad elliptic sepals. Male flowers rosy-purple, much smaller. Fruit 6-10 (-12) cm. long, purple-violet, with glaucous bloom. Distribution: Native of China, Japan and Korea etc. ; cultivated elsewhere. A graceful vine with fragrant dark-coloured flowers in spring. The fruits are rarely produced in cultivation and are edible. A hybrid between this species and Akebia trifoliata (Thunb.) 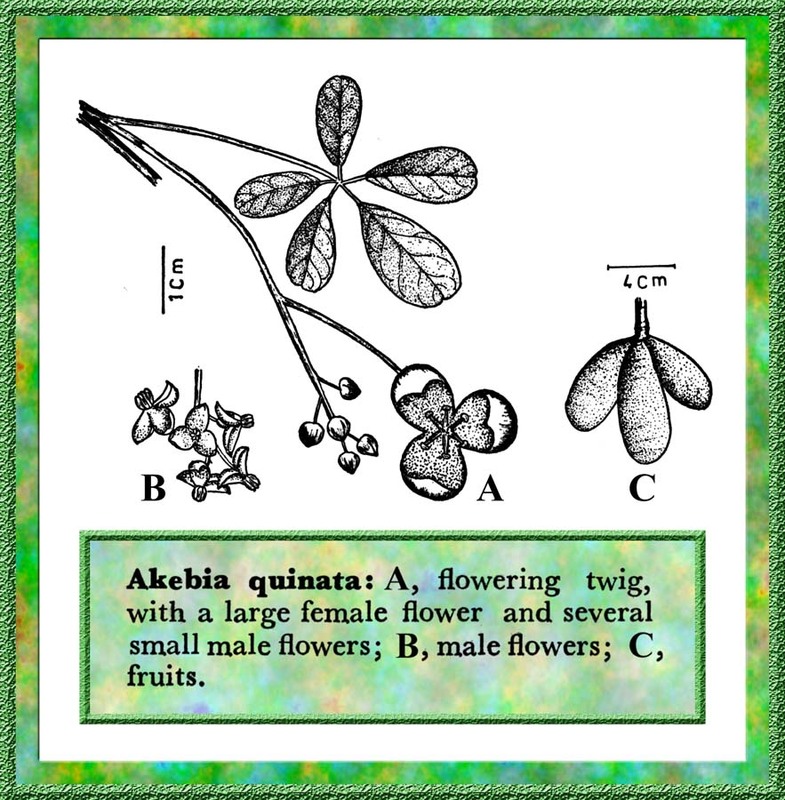 Koidz (with 3 leaflets only) is called Akebia pentaphylla (Mak.) Mak. (with 3-5 leaflets).